Mary Todd Lincoln was a complex woman who has been criticized for her shortcomings throughout the years. However, when her life is examined, she emerges as someone who endured hardships and contributed to the building of the nation in spite of her flaws. Mary Ann Todd was born in 1818 in Lexington, Kentucky, the fourth of seven children. A slaveholder, her father was an affluent banker and provided the family with a comfortable life. When Mary was only six, her mother died. Two years later, her father remarried and had nine more children from this marriage. This was difficult for Mary, and she had a poor relationship with her stepmother. Mary was very well educated. In fact, her level of education was unusual for the day. From 1826 to 1839, she attended several academies and a boarding school where she studied basic subjects as well as literature, French, astronomy, drama, dancing, singing and was instructed in social graces. Her father was a friend of Henry Clay, a leader in the Whig party, and this inspired her to develop an interest in politics and political issues as well. At the age of 21, she went to live with her sister Elizabeth in Springfield, Illinois. Her sister was her guardian at that time. 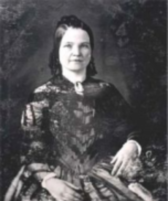 Mary was very popular in the social circles and courted several gentlemen, including Stephen A. Douglas who would become Abraham Lincoln's political rival in later years. However, Mary chose to marry Lincoln after what some would describe as a rocky courtship. Mary and Abraham Lincoln were wed at her sister's home in Springfield on November 4, 1842. He was 33 and she was 23. During their Springfield years when he was a circuit lawyer, Mary was often left alone for months at a time to raise their children and manage the household. Between 1843 and 1853, they had four sons, only one of whom lived to adulthood. Their second child, Edward, died of tuberculosis in 1850 at the age of four, the same year that Willie was born. Mary took an active role in her husband's 1860 presidential candidacy, and she was well suited for it with her knowledge and interest in politics. She had advised him earlier to turn down an offer of governorship of the Oregon territory because it would probably prevent him from taking a potential national position. She was probably the force behind his presidential aspiration. Lincoln's inaugural in 1861 was marred by threats on his life. Considered outsiders, the Lincolns were not accepted in the social circles. Mary was resented for her outspoken views on political issues and especially for her views on slavery. It was at this time she began to exhibit behavior ranging from extreme mood swings, public outbursts and overspending. The sudden death of their son Willie in 1862 seemed to exacerbate her bizarre behavior. When the Civil War broke out in April of 1861, the White House was turned into temporary quarters for Union soldiers and remained so throughout the war. Mary was advised to evacuate, but she chose to stay and support President Lincoln and his policies. Some sources state that Mary spent many hours as a volunteer nurse in union hospitals while others maintain that she functioned more as a visitor who brought food to the wounded, read to them, wrote letters for them and raised money. No matter what the truth is, she appeared to put aside her own problems and grief while showing great empathy for the soldiers. Mary Lincoln will always be misunderstood, and some may argue that she does not belong in the ranks of famous nurses in history. However, while nursing was not her career, she was a force for healing the nation. After the war, she backed the establishment of a nursing corps and was very active in raising money to benefit former slaves. Without her, there may not have been a President Lincoln. There have been a number of stage plays, films and television series about the Lincolns over the years, but there seems to be a resurgence of interest in the last few years. Notable is Steven Spielberg's recent film, Lincoln.